NOTE: When you are chainning more than 6 of these lights ! "The input power connector has an inline 3 amp fuse and the fuse was blown on the two dead lights. Each fixture requires .46 amp or round up to 1/2 amp. This means you can only connect 6 of them in a chain with IEC link power cables (6 X 1/2 = 3 amps). I bought a 12 pack of lights and connected all 12 of them so I need 6 amp or greater fuses to be able to do that. I ordered new fuses from Amazon and although I haven't recieved them yet, I think this problem is solved. If you have a FAQ, you should add this to it for the next guy that thinks his lights are dead when it is only a fuse. With the included 3 amp fuse, you can only connect 6 of them with an IEC power link cable. If someone needs to connect more than 6, they need to replace the fuse with a size that is at least 1/2 amp per fixture." Contributed by a professional and lovely customer. MODES: DMX512, Sound Active, Master/Slave, Auto Run (Program Run) and Skip Run (not by the program order). 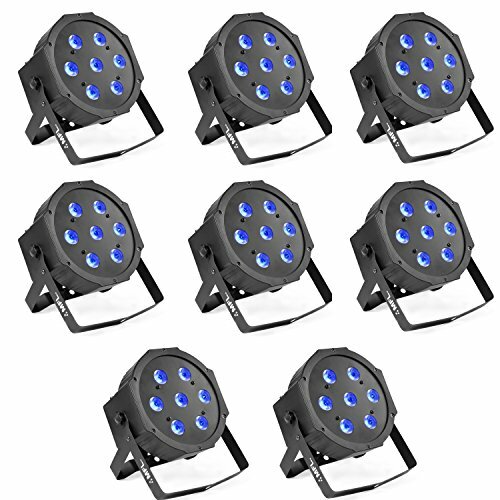 LIGHT SOURCE: Super bright 7 x10W QUAD leds，Red, Green, Blue, simple operation Par Can Light. DUAL MOUTING BRACKETS to be put/hung inside a truss, or lay flat on the ground, side DMX IN&OUT for convinient dmx connecting. WARRANTY: We provide a one-year repair warrant for this dj lighting package. POWER SUPPLY: AC110V-250V, Frequency: 50-60Hz, Power consumption: 75W, super bright up lights/ wash light for party, nightclub, church, concert and more. If you have any questions about this product by MFL., contact us by completing and submitting the form below. If you are looking for a specif part number, please include it with your message.